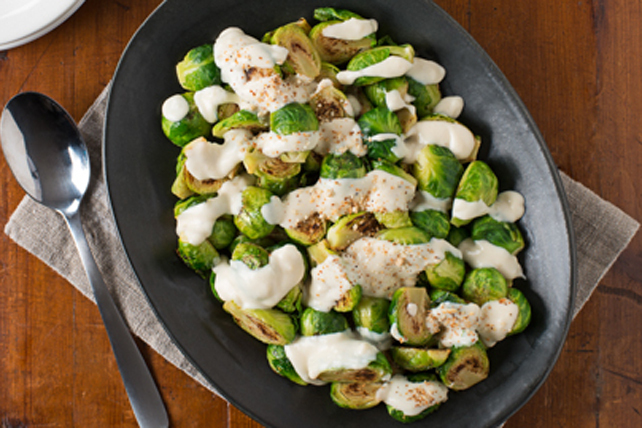 Toss Brussels sprouts with 2 Tbsp. oil and pepper; spread onto large parchment-covered rimmed baking sheet. Bake 18 to 20 min. or until sprouts are tender and golden brown, turning occasionally. Meanwhile, heat remaining oil in small skillet on medium heat. Add bread crumbs; cook and stir 2 to 3 min. or until golden brown. Remove from heat. Heat pasta sauce as directed on label. Serve sprouts topped with pasta sauce and bread crumbs. Top with 2 Tbsp. chopped toasted pecans or hazelnuts before serving.